Artist Barry Moser whose work is represented in The National Gallery, The Metropolitan Museum, and The British Museum, has created a poetry broadside specifically to raise donations for A Positive Place, a non-profit organization providing a wide array of support services for people with HIV/AIDS in Western Massachusetts. 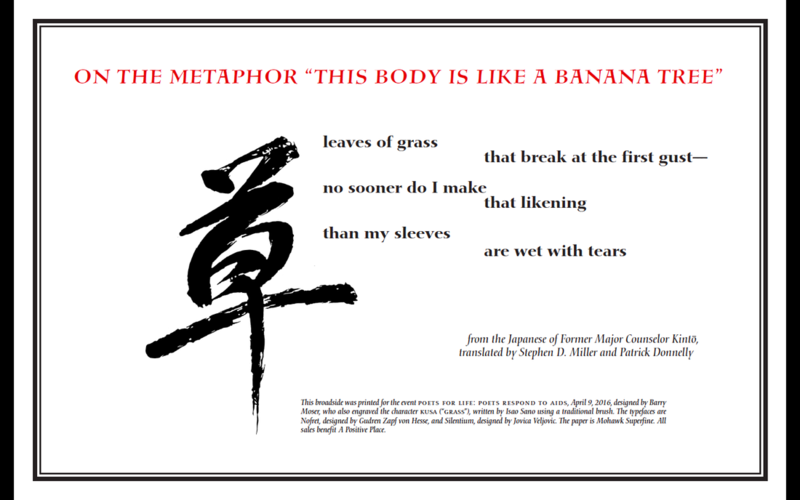 The broadside features a Japanese poem “On the Metaphor ‘This Body Is Like a Banana Tree,’” translated by Patrick Donnelly and Stephen D. Miller, and the Japanese character “KUSA” (“GRASS”), written by Isao Sano using a traditional brush. There will be a small additional charge for shipping and handling, but all proceeds from broadside sales will go directly to A Positive Place. Since 1991, A Positive Place, formerly AIDS CARE/Hampshire County, has been the sole provider of comprehensive, confidential case management and health-related support services, filling life-saving needs for people living with HIV/AIDS in Hampshire and surrounding counties. Anyone living with HIV or AIDS is eligible for services regardless of level of need, health status, or ability to pay. Services are free of charge to people living with HIV. Please direct broadside orders to Patrick Donnelly at PatrickSDonnelly@aol.com.